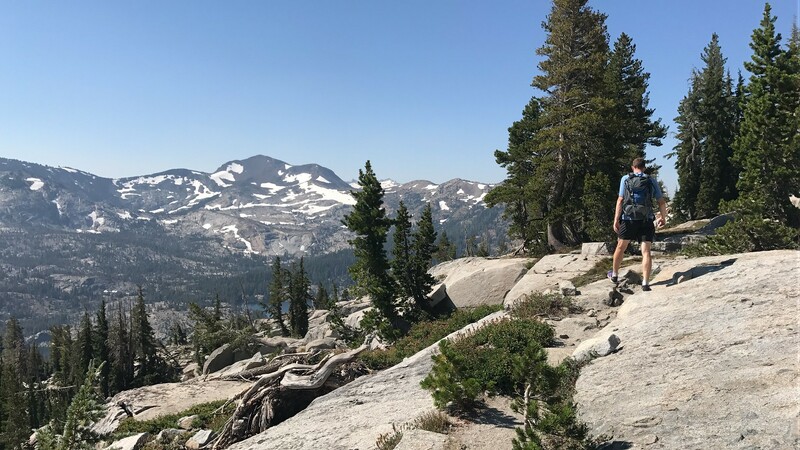 went deep(er) into Desolation Wilderness but didn't take a full day due the to logistics of getting to the trail and back. we could finish mid-afternoon so that there is time left to meet up with José and Casper somewhere. allowed José and Casper to meet up with us without a car. Joep and I needed the car to get to the trailhead before dawn. For any point-to-point hike, we would either have to use public transport or hitchhike to get back to the car. For José and Casper to meet us anywhere they would have to rely on public transport. 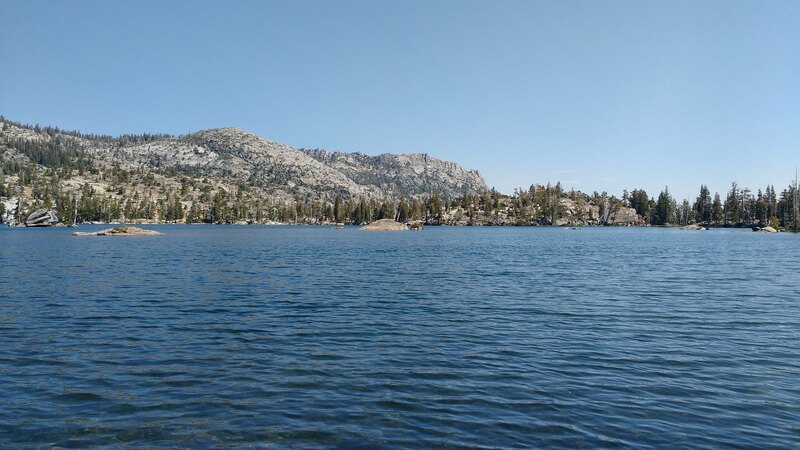 Lake Tahoe's public transport is a mishmash of services by two different agencies: Tahoe Truckee Area Regional Transit (TART), who services Tahoe's North shore and Tahoe Transportation District (TTD), which covers the rest of the lake's shores. The West shore —where we were staying, has a particularly confusing set of services available. The lines operated by TART don't extend beyond Tahoma. And TTD's service appears to go only as far north as Emerald Bay in the service overview below. 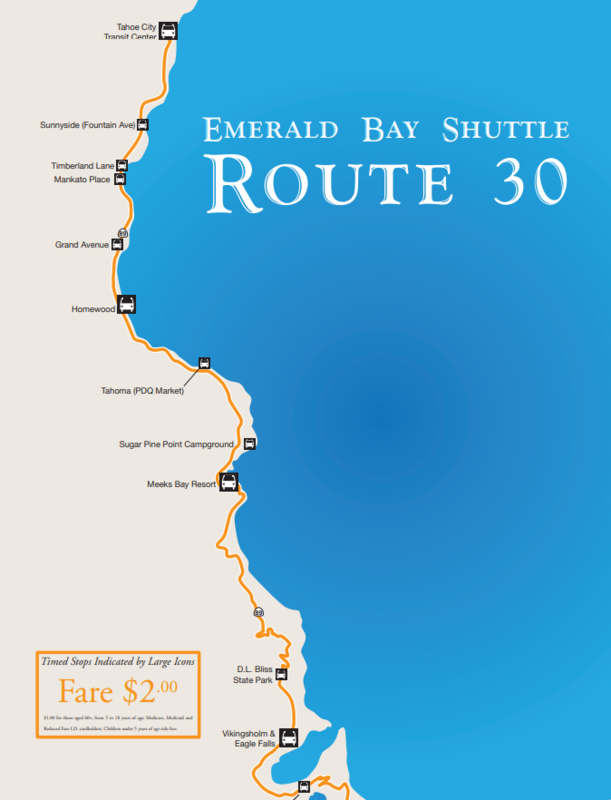 Upon closer inspection the Emerald Bay Trolley (now called Emerald Bay Shuttle) does run all the way north to the Tahoe City Transit Center. And does in fact, stop at Sunnyside, not far from our cabin. Perfect! For only $2/person José and Casper can ride the trolley to Emerald Bay, the end point of our hike. Joep and I can take the car to the trailhead in Meeks Bay and leave it there. 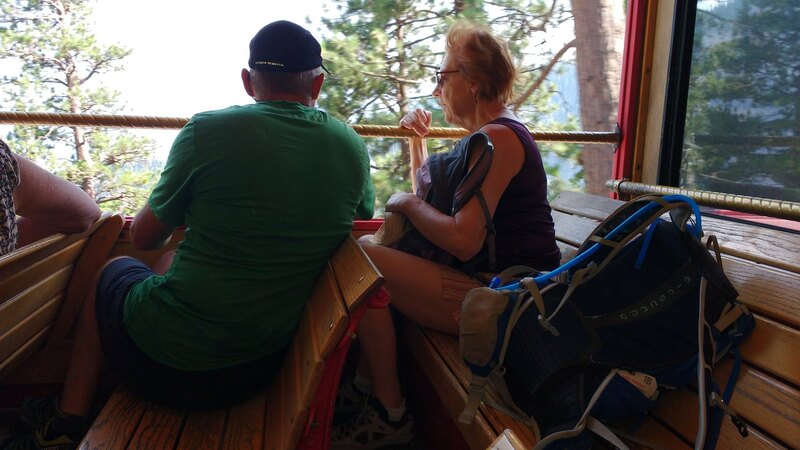 The four of us will ride the trolley back to the car after we spend the afternoon in Emerald Bay visiting Vikingsholm. 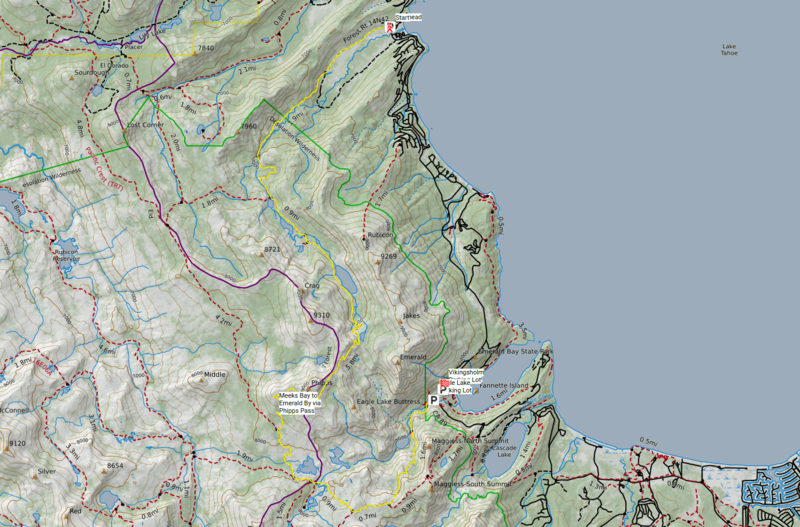 I mapped out our route on the excellent CalTopo site and exported Way Points to the Topo Maps app on my iPhone. 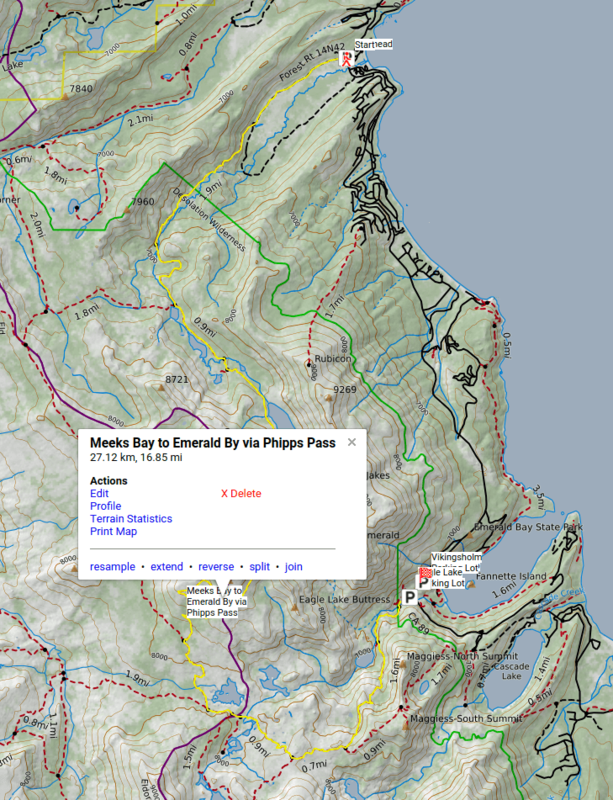 The interactive CalTopo map is linked below. CalTopo also produces these nice elevation profiles, including slope angle, tree cover and aspect information. Joep and I crept out of bed as quiet as mice in an effort not to wake up Casper & José. We got to our trailhead in Meeks Bay in no time thanks to empty roads at this early hour. Where we self-registered our day permit, dropped it off in the "iron ranger" and were off by 6:20 AM as it was just getting light. We warmed up in the first 1.5 almost flat miles along Meeks Creek. A quick gradual climb brought us to Lake Genevieve where we saw the sun kiss its western shore. Taking advantage of the cool morning we continued past backpackers emerging from their tents to Stony Ridge Lake. 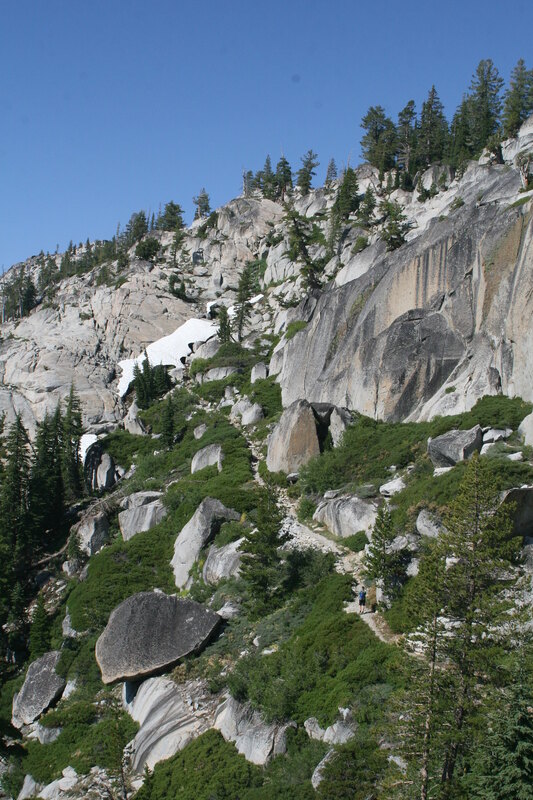 The trail hugs the western shore below a "stony ridge" I can only imagine the lake is named after. The terrain steepens and we encounter the first switchbacks from where we look back onto a lovely view of Stony Ridge Lake. 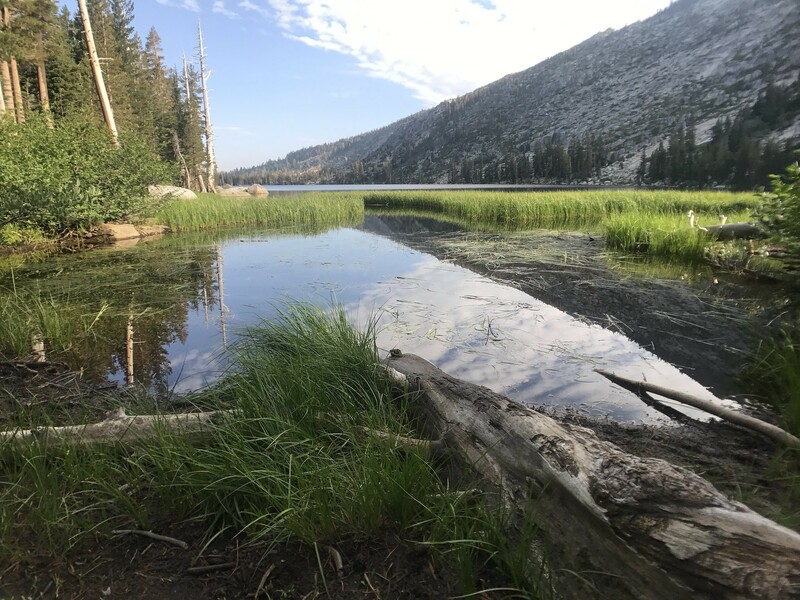 The terrain levels out and reveals Rubicon Lake where we enjoy 2nd breakfast. 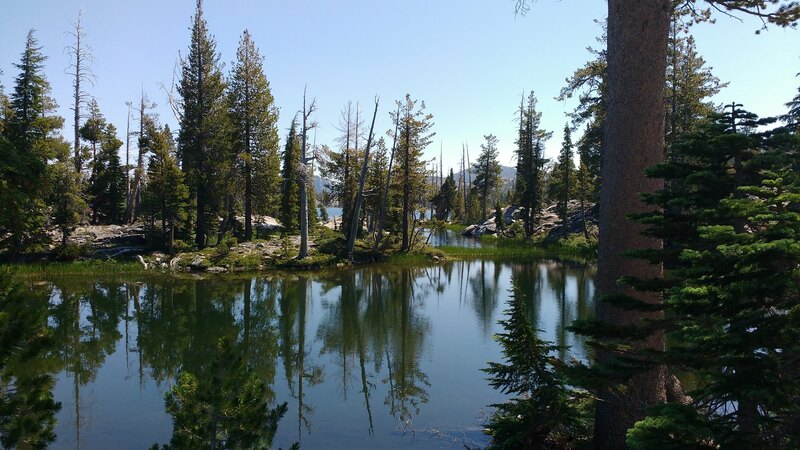 At Rubicon Lake, the trail turns South West towards Phipps Pass, at 8800', our high point of the hike. Halfway along the traverse of the South East face of Phipps Peak, there is narrow gully that has snow until late into the summer. Even now, on August 20, 2017 there is still snow, thanks to the high snowfall last winter. 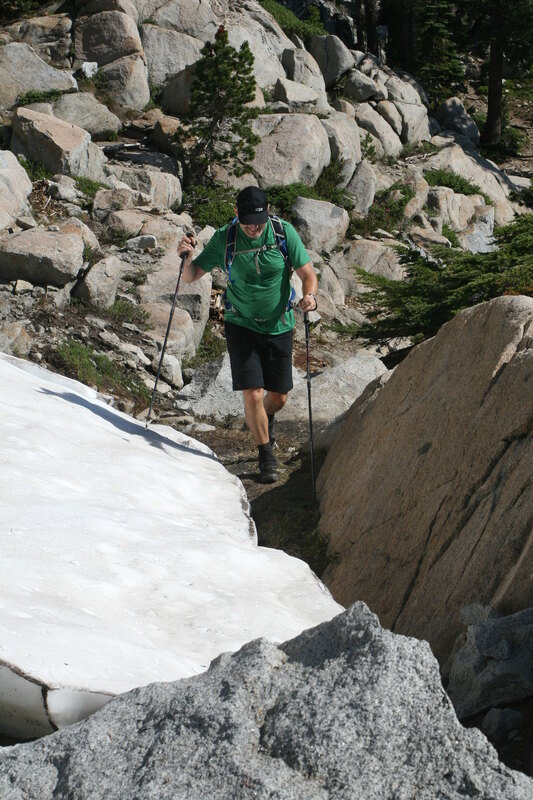 The gully is relatively steep and the snow can be difficult to get onto, so we don't know what to expect. All we know is that the snow is passable. We get our first glimpse of the snow soon after leaving Rubicon Lake. It doesn't look bad at all. The snow is a good 6' tall and ablated to a 45° overhang where it crosses the trail. By going down the slope towards the tip of the snow we can climb onto the snow and scamper across. And without mishap, we're both across. Up and onwards to Phipps Pass, which is just around the bend. The view widens when we cross Phipps Pass. 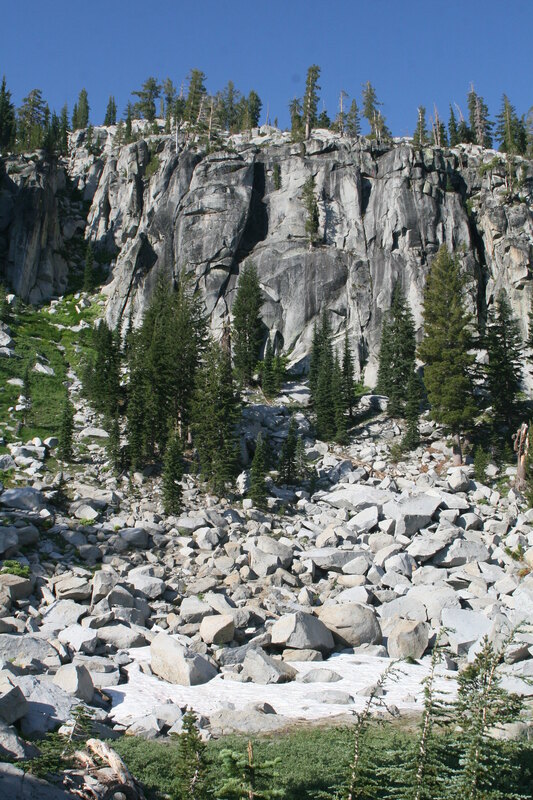 The pass has a grand view of the granite world of Desolation Wilderness. We're losing altitude on the other side of the pass. 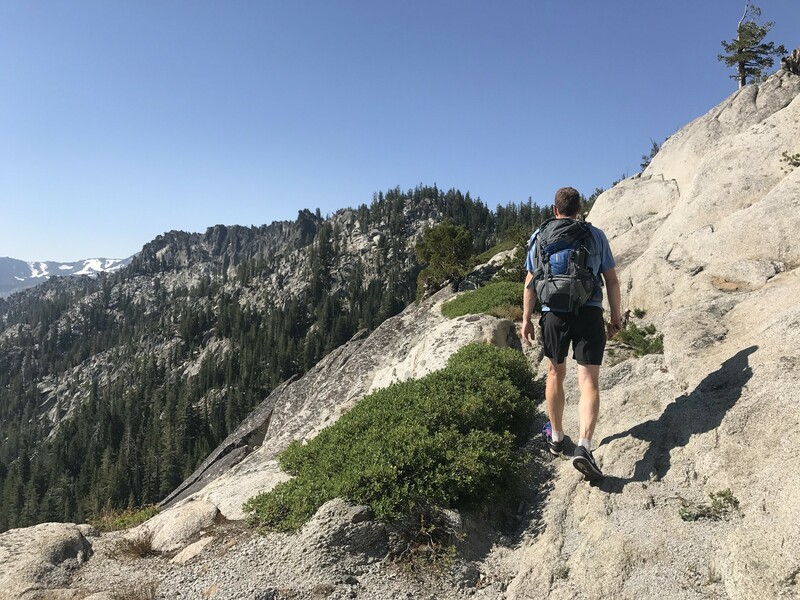 Gradually at first but ever faster until the trail levels out again and meets up with the Pacific Crest Trail. Which we follow to the Velma Lakes. Middle Velma Lake slowly reveals itself. First, we encounter a few "fingers" but soon we lunch on its South shore. A gentle breeze keeps us cool and we rest our feet in the cold water. Sooo refreshing! We start to try and reach Casper on the walkie-talkie 2 way radio we carry. We're no longer in cell range. 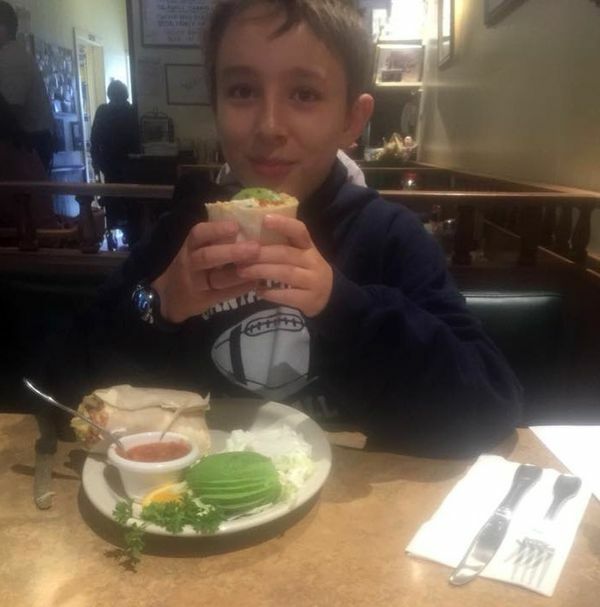 The last contact we had with José and Casper was from Phipps pass. No luck. Can't tell if we're too far apart, or blocked by the last hump we have to hike over or if it is something else. 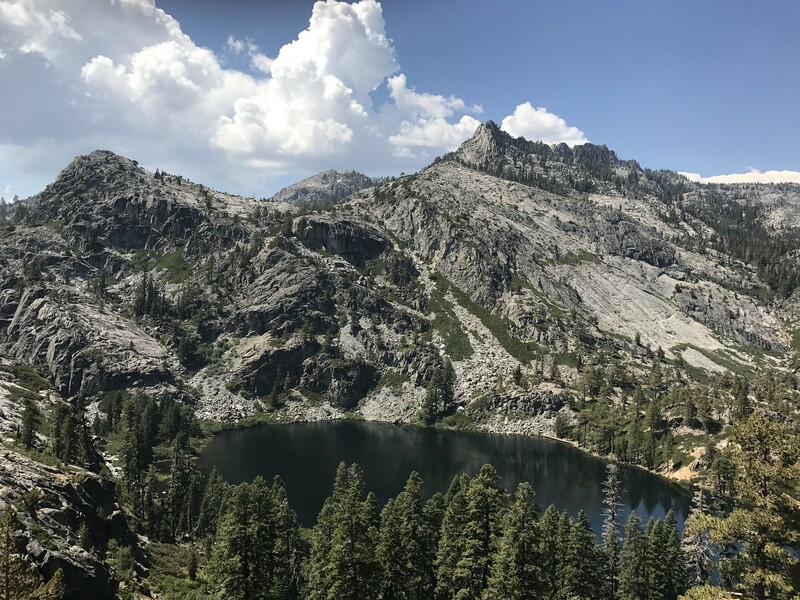 We cross the hump and descend steeply to Eagle Lake, a small alpine lake less than a mile from the Eagle Lake parking lot. It is pretty but also crawling with people! Still no radio contact. We're starting to wonder if our battery is running low. They should definitely be within range by now. We wait awhile, thinking they might be hiking in to see the lake. But after eating a bar or two, there is nothing left to do but head to the parking lot. Where we don't find them. On to the Vikingsholm parking lot across the street. Also nothing. We're combing the parked cars along the road. Again nothing. This is not as planned! Joep and I decide to split. He will continue looking and try the radio from time to time, while I will go get our car. Of course, I just missed the Emerald Bay Trolley, the next one is in an hour. Hitchhiking it is! Out step Casper & José. They tell a tale of woe. Their South bound trolley never showed. So, they hopped on a TART bus but didn't go far enough and had to get out and try the trolley again. Missed the trolley. Started hitchhiking but got out too soon. Didn't know where they were exactly, yet tried to walk to Emerald Bay. Found out it was too far and started hitchhiking again, which brought them here. And their walkie-talkie never worked. Reunited we set off to find Joep, who we find near the Lower Eagle Falls. We hang out at the falls for a while, playing in the water and enjoying that everything worked out in the end. 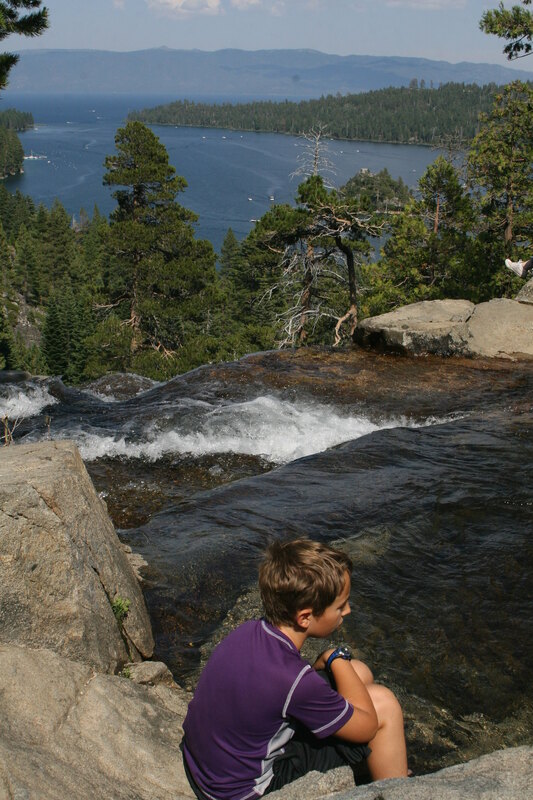 We hike down to Vikingsholm which we explore (from the outside) and hang out at Emerald Bay's beach before we head back up to the trolley stop. At long last, we get to ride the open air trolley. On Casper & José's 3rd attempt, they finally make it onto the trolley. The trolley —of course, has a mind of its own. I spot our destination stop at the last second and pull the cord, yet the driver doesn't want to stop. I have to walk over to her and ask her to stop. We walk the 1/3 mile back to the car, relieved that she didn't take us all the way to the next stop. I recorded our hike on Strava, where you can retrace our progress and see how we did. 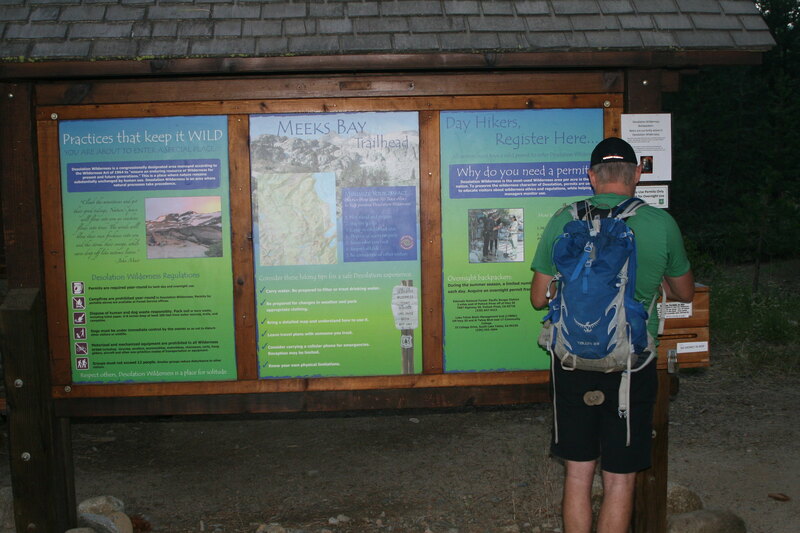 You can hike in either direction, from Meeks Bay to Emerald Bay as we did or from Emerald Bay to Meeks Bay. 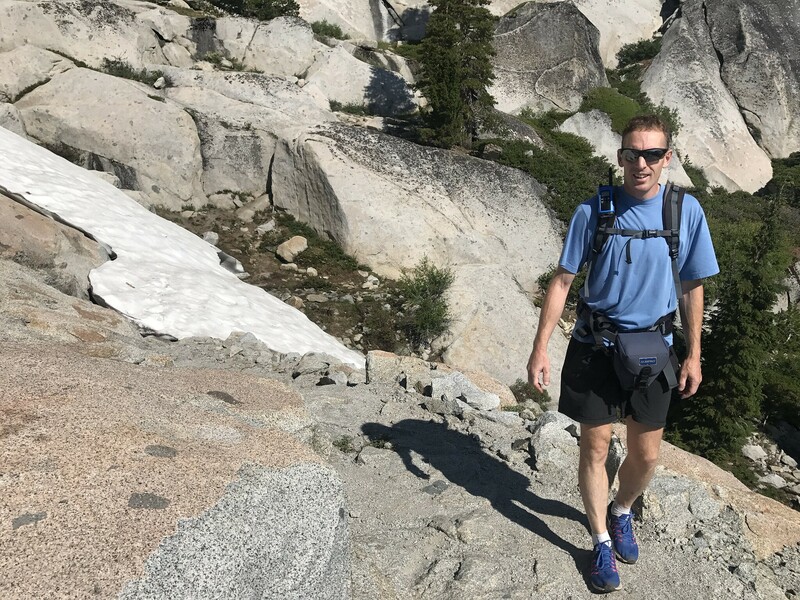 I recommend starting in Meeks Bay so that your climbs are much more gradual. You can do it as a day hike like we did. Or you can do it as an overnight hike. When Casper was 6, he and I did the same hike as a 3 day, 2 night hike. 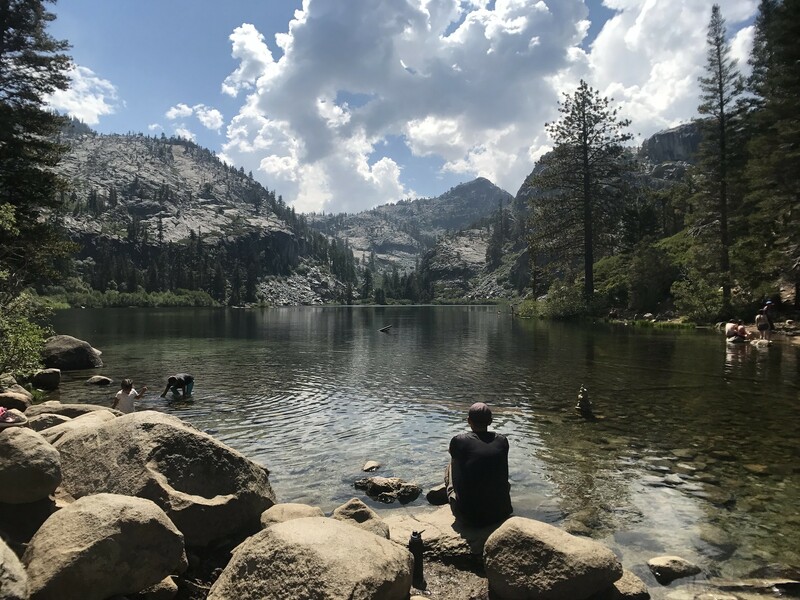 We picked up our permit at a ranger station, parked the car at Emerald Bay, took the trolley to Meeks Bay and hiked the first day to Crag Lake. Roughly a 6 mile day. 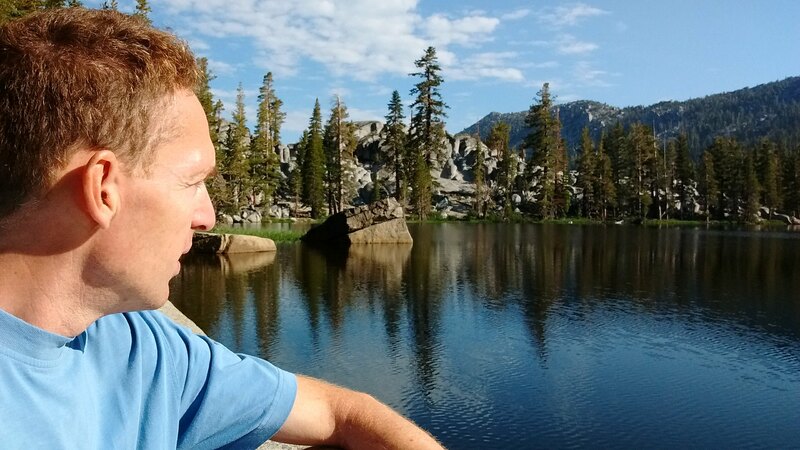 The 2nd day we hiked another 6 miles to Middle Velma Lake with enough time to spare to play in the lake. 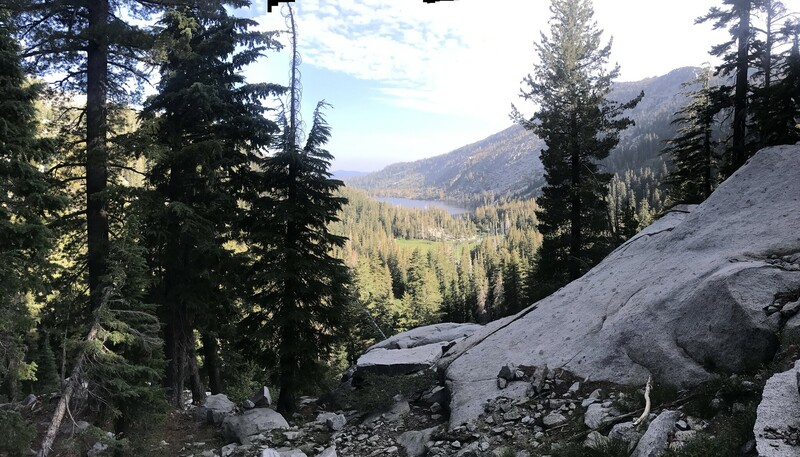 On day 3 we hiked the last 6 miles out to our car at Emerald Bay. The shorter days allowed Casper to hike about half the distance himself and ride on my shoulders the remaining miles. Camping at a lake offered young Casper plenty to entertain himself with. Plus the company of other campers (including a dog!) so that he wasn't always alone with his "poppy". A wedding, a super blue blood moon and a parent/teacher conference. Plus the start of Beginning Welding class. Casper's twelfth birthday and birthday party. Google Play Books launches Audiobooks, it's great! Ursula le Guin's death made me remember her Earthsea series. And stopping subscriber spam on this blog.